Our art consultant meets with the students for an hour each week. Artistic expression is encouraged through exposure to a variety of materials, with a focus on process over product. 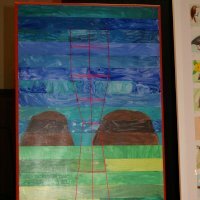 Many art projects are developed to coincide with art exhibits at Bay Area museums. 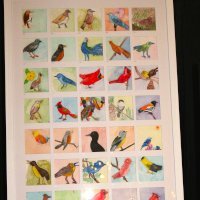 In the spring, the art consultant organizes and submits student artwork to be displayed in the annual San Francisco Arts Festival. Each year we also enjoy a school-wide Community Arts and Sciences Day. The Art Year in Review — 2009-2010. These are projects that we completed during the year! Hands Overlapping Watercolor; Georgia O’Keefe Skull/Landscape Drawing – SFMOMA; Georgia O’Keefe Close Up Flowers/Shells Painting – SFMOMA; King Tut Self Portraits paintings — de Young Museum; Ansel Adams — Black and White photos – SFMOMA; Silhouette Landscapes — Museum of African Diaspora; Samurai Culture and Art — Asian Art Museum; Egyptian Pyramids and hieroglyphics — de Young Museum; Samurai Ink paintings — Asian Art Museum; Color Theory — color mixing; Maurice Sendak books — Contemporary Jewish Museum; Surrealistic dog collage; Animal safari drawings; Animal collage; Quilt patterns (drawing, painting, sewing) — de Young Museum, Amish Quilts; Burlap sewing — Museum of Craft & Folk Art; Piet Mordrian abstract art – SFMOMA; String paintings/printmaking; Texture collage/rainbow; Earth Day collage; Hamsa — Good luck hand pictures; Sign Language drawing; Landscape paintings; Black and White/upside down/in & out; Paper Sculpture; Word Art; Fabric balls.